The final frontier gets rather mixed treatment from Hollywood. The studios have had a penchant for filling the void with monsters and other extra-terrestrials but now it’s the scale and sheer emptiness that are scary, while it's hard to ignore the prospect of travelling towards infinity and perhaps never coming back. Space on screen is a broad canvas where just about anything goes, from thoughtful to grand to spoof, so it’s a surprise to see a film like First Man that is serious, low key, compelling and based on the real thing, when man first stepped on the moon, an event captured on grainy television images 50 years ago. Ancient history for many, but it has to be as remarkable today as it was then, decades before the digital age. 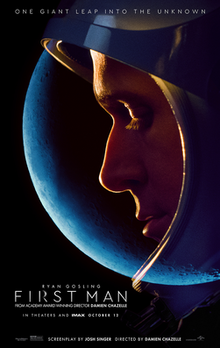 When we meet the famous astronaut, Neil Armstrong ­- Ryan Gosling in the role - it is some years before the moon mission, when he and his wife Janet (Claire Foy) are having a terrible time, facing the loss of one of their small children to cancer. An aeronautical engineer and test pilot, Armstrong is struggling to do his job effectively but his cool head does eventually prevail and he applies to join the new team that will attempt a moon landing within the time frame that the late President Kennedy nominated. A ‘fresh start’ Janet says, after their little girl has died. This story of the Apollo 11 mission is told from inside a marriage, a good marriage, and Janet has a pivotal role in it. The obligatory scenes of national pride and the global impact of the event are delayed until towards the end, and portrayed like a postscript. Such restraint. First Man still makes clear that the pioneer astronauts were highly skilled, brave men who understood the risks involved. They were asked to approve their obituaries before they left. The fine screenplay is by Josh Singer, and is based on an authorised biography of Armstrong by James R Hansen. It is worth knowing that two of Singer’s recent screenwriting credits are for The Post and Spotlight, each of which concerns pressing issues of our time – a free press and institutional child abuse – and critiques the way they were dealt with in America. Recent impressive films set in space like lnterstellar, Gravity and Arrival invite you to think and they are gorgeous to look at, but results are mixed. First Man does away with visual extravagance, and declines to philosophise about the void out there and what it might mean for us. The focus is instead on the astonishing feat of putting men on the moon, a story that is delivered with impeccable naturalism. The emphasis on authenticity is crucial, though I don’t quite understand why the equipment had to look a little dated, as though it had been brought in from a space museum. No doubt, everything was brand new in 1969. The production design is also sombre, without a hint of triumphalism. Apparently, some don’t like the fact that director Damien Chazelle and his team decided against showing the planting of the US flag. Looking at the names of those who have complained and called it an omission, First Man is better off without their endorsement. ‘Participatory’ theatre festival in Goulburn.